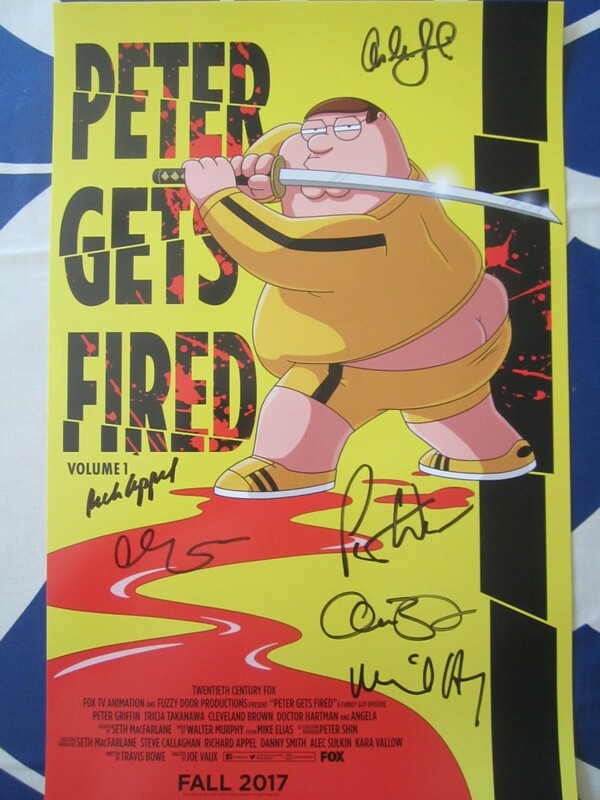 Roughly 11 by 17 inch mini promo poster for the hit TV show Family Guy autographed in black marker by stars Mike Henry (Cleveland Brown), Patrick Warburton (Joe Swanson), Alex Borstein (Lois Griffin) and Alec Sulkin (Jesus) plus executive producers Rich Appel and Cherry Chevapravatdumrong for a total of 6 signatures. Obtained in person at extremely limited 2017 San Diego Comic-Con signing. With certificate of authenticity from AutographsForSale.com and photo from the signing. ONLY ONE LEFT.